Greg Moore, Registered Piano Technician® tunes and services pianos throughout most of Vermont. 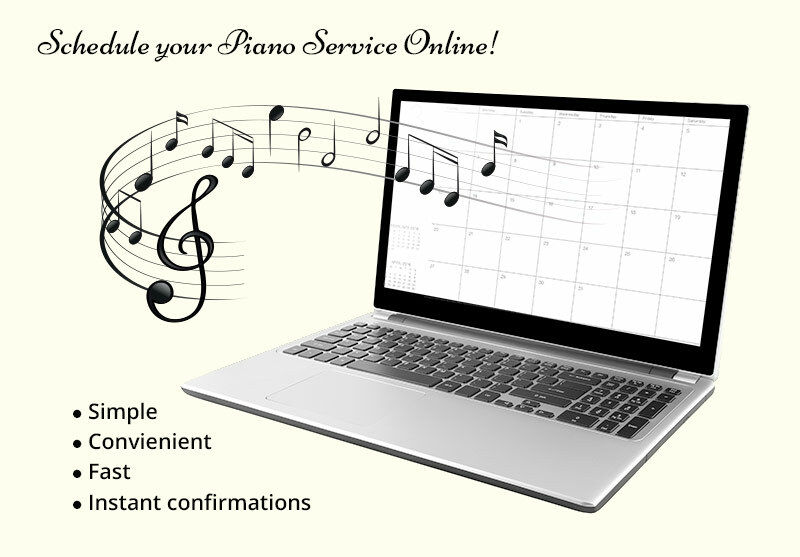 He is excited to now offer a new online scheduling service, the Smart Scheduler, to make it easier and more convenient for his clients to schedule piano service. Simply click the link below to schedule online without having to make a phone call or email to coordinate a date and time. The Smart Scheduler will ask for a few things like an address and approximate date you wish to schedule your piano service. Options for service include some of the more basic services like Tuning, Regulation, or Sticking Key. The Smart Calendar will automatically calculate all the variables of Greg’s schedule and yours and give you a few options to choose from. After selecting the best option, you will get a notification via email with all the information regarding the appointment! It’s that quick, that easy! For piano moving, please use the piano moving page to schedule a piano move. Also, for more detailed services including voicing, rebuilding etc. give Greg a call directly or email the request for those services. Greg enjoys discussing your piano needs whether it is tuning, humidity control, or negotiating a sale.